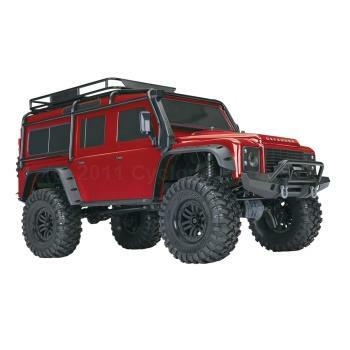 The Traxxas TRX-4 1/10 Scale Trail Crawler greatly expands features, versatility, and capability when compared to the status quo. The unique portal axles lift the center pumpkin for huge center ground clearance and feature gear reduction at the axle end, eliminating torque twist. The portal axle design has improved suspension geometry with reduced driveshaft and suspension link angles, meaning less strain on the drive shafts, and the higher suspension links provide greater ground clearance. The TRX-4 Trail Crawlers use remote locking differentials, allowing you to lock or unlock the front and rear differentials separately, creating better handling at higher speeds and superior grip over extreme terrain. Portal Axles lift the center pumpkin for huge center ground clearance. Gear Reduction at the portal axles eliminate torque twist. Improved Geometry by reducing driveshaft and suspension link angles. Rigid Steel Frame crates a rigid backbone for less chassis flex and better control. Remote Locking Differentials allow you to lock or unlock front and rear differentials separately. 45Â° Steering Angle with differentials unlocked.